Sorry... the 2017 Mercedes-Benz AMG S 63 is no longer being sold as new. The 2017 Mercedes-Benz AMG S 63 is a new, high-performance version of the S-Class that comes as a coupe, a cabriolet, or a sedan. It is positioned below the AMG S 65. The AMG S 63 has sportier styling than the regular S-Class. The main difference is that it has larger openings at the lower fascia with airflow-channeling winglets. The rear lower fascia is molded around trapezoidal tailpipes. LEDs for the headlights, daytime running lamps, and taillights come standard. Other standard features include a panoramic moonroof and 19-inch alloy wheels. Carbon fiber exterior accents and larger 20-inch AMG wheels are also available. 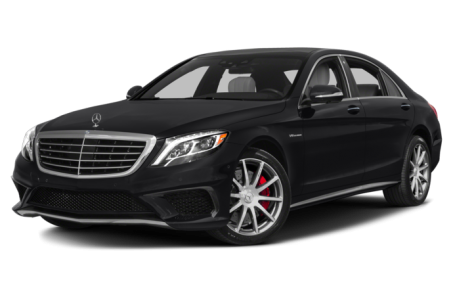 The AMG S 63 is powered by a standard 577-hp, twin-turbocharged 5.5-liter V-8 engine mated to a 7-speed automatic transmission that produces 664 pounds-feet of torque. All-wheel drive (4Matic) comes standard. Standard adaptive sport suspension provides responsive driving dynamics for different road conditions. Inside, the AMG S 63 has a premium Nappa leather upholstered interior. The center stack features a standard COMAND multimedia system with a 12.3-inch display, navigation, a touchpad controller, Bluetooth connectivity, Wi-Fi hotspot, and a Burmester premium audio system. It can be upgraded to a Bang and Olufsen surround sound audio system. Standard features include dual-zone automatic climate control, heated/ventilated front seats, air cabin purification system, and push-button start. Unique quilted upholstery, a heated steering wheel, a rear seat entertainment system, heated rear seats, and a heated steering wheel are optional. Free for the first five years is the mbrace Connect service that includes roadside assistance, remote vehicle diagnostics, vehicle finder, and more. Other standard safety features include a surround-view camera system and a collision prevention system with adaptive brake assist. Adaptive cruise control, blindspot monitoring system, rear-cross traffic alert, lane keep assist, and pre-safe braking with pedestrian detection are available as well.